What is the value of a pool fence being manufactured and assembled in the United States of America? When Florida mandated the controversial “4th side” pool fence requirement between a pool owner’s back door and swimming pool, pool owners who didn’t have children nor any use for a pool fence were required to install a fence nonetheless. Existing property fences, such as wooden privacy fences, satisfied the need to isolate their pool from neighborhood children, so this new additional fence across their patio became “invasive.” Because they had no intention to keep such a fence, demand was created for the absolute cheapest option that would satisfy the code and then could be removed immediately. Today, many US manufacturers and online suppliers import all or part of their pool fences from China. Protect-A-Child is one of the few in the mesh pool fence industry who continue to concentrate on fence strength, longevity, value and American-made quality. In today’s global economy, it is easy and inexpensive to outsource to China. Because of our 32-year reputation and extensive product warranty, we cannot take a chance on the hidden shortcuts in quality that don’t reveal themselves until months or years later. We continue to take advantage of proven, technologically advanced manufacturing methods to keep our prices reasonable and to outperform low-cost, low-quality import fences. 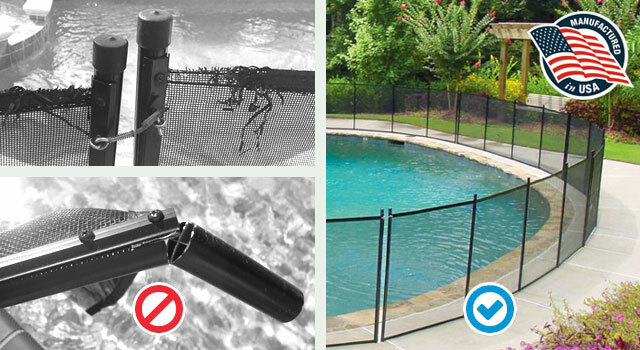 Remember, not all pool fences are created equal. If you have children or pets, you owe it to them to look into a pool fence that is designed to keep them safe while standing the test of time. At Protect-A-Child, we’re committed to building and designing fences that don’t sacrifice safety and quality for cost. If you are interested in getting a fence for your pool, visit the pool fence dealer page to locate your local dealer for a free quote.